After an hour of this game it was still by no means certain who would be victorious as the traditional hard fought derby between "The Leds" and West unfurled. Fortunately, it was our pack which had the upper hand as the game entered its final phase and we ran in three tries to secure the vital five points whcih keep us in touch at the top .. It was the first time the two first teams had met at Horden and Peterlee’s new Eden Park ground with the big pitch expected to suit the visitors. In reality the game settled down to the usual forwards battle with the home pack starting off in some style. We had a late change with John Bunter forced to seek expert advice on an eye problem , fortunately it has proved to be nothing too serious. As a result Chris Atkins returned to the second row with Isaac Robinson in his usual position in the back row. In front a decent crowd Horden started off with their big pack showing it meant business and forcing several scrum penalties in the first few minutes -only for a high tackle on Scott Butcher to relieve the pressure. However, it wasn’t until the quarter hour that we were able to get into the home 22. We did so with some effect as winger Callum Johnston and skipper Ryan Painter combined to send Peter Youll through a gap ten metres out to set up the conversion for Zac Southern. The pressure on the home line continued, and when we took a quick penalty Callum Johnston showed tremendous balance (right) to keep two tacklers at bay while avoiding stepping into touch. He then timed his inside pass to send Luke Mallinson over. 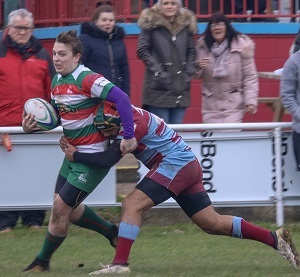 The lead was stretched to 19-0 when Jake Linighan stole Horden and Peterlee’s line-out ball on their 22 - Chris Atkins touching down as his pack drove over (pictured). That only served to galvanise the home pack who got their team back into the game in the last five minutes of the first half. Lively scrum half Neil Hartley got their first try of the afternoon - gathering from the base of the scrum and showing a clean pair of heels as he raced round the blindside. Cameron Lithgo was wide with his conversion. But he was on target with the last kick of the half after centre Ben Crake took advantage of missed tackles in the midfield to bring his side right back into the game. It came when a West line-out throw in our own 22 was caught by the wind to fall neatly to flanker Carl Brown. The ball was quickly moved wide where the wiry Lithgo evaded the first tackler to send in Darren Edwards as he was stopped just five metres out. It looked like we may once again be on the end of a shock defeat at the hands of the hard working Collierymen, but skipper Ryan Painter had other ideas. Luke Mallinson made ground up the left with a penalty kick, and when Linighan once again took good line-out ball, the West forwards forced their counterparts onto the back foot with Painter collecting and forcing his way through a gap. That score gave us that vital bonus point and Southern’s conversion once again put us one score ahead but definitely still out of any comfort zone. That was achieved in slightly unusual circumstances on the hour. Left winger Adam Larkin collecting a clearance kick in his own half - chipping over the onrushing defence. Full back Jack McCallum looked to have the ball well covered as he patrolled his own line only to slip with the the watchful Larkin accepting the easiest of touchdowns and the conversion stretching the score to 33-19. Instead we had the final say with Zac Southern selling a dummy to create space for himself to go over next to the posts. The exertion cost him a strained hamstring with Mallinson taking the conversion to add the final points of a hard-fought contest. No game next week and a well earned rest after scoring 90 points on our travels in the last two games. Next up is the visit of an in-form Stockton on February 9th. West: Luke Mallinson, Callum Johnston, Will Hilditch, Peter Youll, Adam Larkin Zac Southern, Ryan Painter (capt), Adam Coates, Andrew Rollins, Adam Brown, Chris Atkins,, Jake Linighan, Isaac Robinson, Alex Barker, Scott Butcher.